Some film festivals ice their cake with a thick frosting of glamour, star power and Hollywood hullabaloo. Others are more reserved and understated. The Sun Valley Film Festival is young, with an attitude that is reflective of the city. The programming offers a preference for content over tinsel. The third annual film festival is presented this March 13-16. Sun Valley Idaho is a small resort community with pristine skiing in the winter and all the glories of nature in the summer. This is Ernest Hemingway country, where beauty is appreciated and understood. Sun Valley does not need neon to spell h-e-a-v-e-n; it just is. The majority of homesteads are of the vacation variety, belonging to the insouciantly powerful and quietly monied. There is a reason why Allen & Company holds their annual heavy-hitting media and finance conference in Sun Valley rather than Las Vegas. Sun Valley just is. And so is their film festival. The line-up has been curated with an eye on the demographic of the well-heeled resort town. The diversity of film fans is wide. Executive director Teddy Grennan explains that a ski lift operator, a private pilot and the owner of a banking empire all stand shoulder to shoulder. Greenan comments, "It is a sophisticated valley with a very smart crowd." What was his curatorial inspiration? Grennan replies, "Disc Jockey Nic Harcourt of KCRW's Sounds Eclectic. It's a diverse line-up. No rhyme or reason. As long as it's the best." Honestly, in Sun Valley one does not need to go to a film festival to see movies stars. You just go to the supermarket. "Let's face it, ski helmets and fly fishing waders are equalizers," says Sun Valley regular Dana Agamalian, "It's not the glam parade here." The quiet lineup of films offers several standouts. 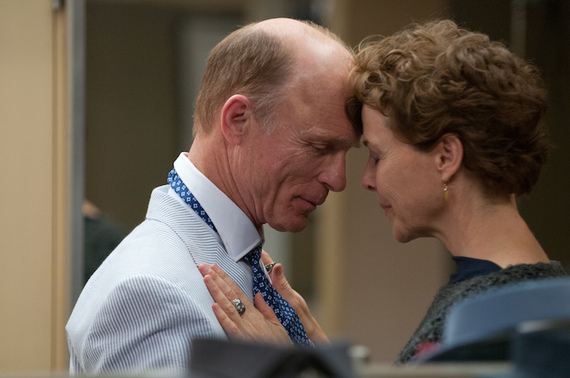 Opening the festival is The Face Of Love, starring Ed Harris, Annette Bening and Robin Williams. No one knows much yet about director and co-writer Arie Posin, a product of the prestigious University of Southern California film school. We will now. With a top-shelf cast in his film, Posin can march to the head of the class and write his name on the blackboard. The film looks promising with our favorite stars working hard and chewing the scenery. This shall be Posin's graduate test, to corral the melodrama into substantive believability. If he succeeds, you better bring the Kleenex. Award winner Blue Ruin is an interesting film that has been screened at the world's finest film festivals. The most recognizable name before or behind the camera is actress Eve Plumb from the Brady Bunch. While Blue Ruin may be low on names-we-know, the film puts a spotlight on talent. The film offers a fresh, suspenseful take on the classic revenge flick. Most notably, Blue Ruin has been praised and heralded throughout the Internet cinema world. The French may have Cahiers du Cinema, but we have Ain't It Cool News and Rotten Tomatoes; there is no greater authority. War Story is a film that has flown low on the radar. I can think of no greater actress to play a brutalized war photographer than Catherine Keener. The planes and edges of her handsome face are so passively expressive. In the film, she struggles to disengage from the horrors of war with the help of her mentor played by Ben Kingsley. Set in Italy and the Mid East, the film looks promising and sadly, timely. When Gone With The Wind celebrates its centennial, I won't mind for I have little invested. Unfortunately, the 20th anniversary of Kevin Smith's Clerks dates me; I am reminded of my distant youth and unavoidable mortality. This year the Sun Valley Film Festival will celebrate the seminal film. 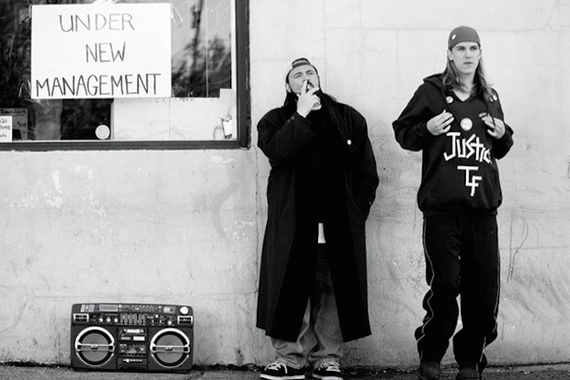 Actor Jason Mewes will hold court with Kevin Smith at a celebratory Q&A. The extremely entertaining Smith will also lead a panel and a screening for his film Red State. Now we know what he's been up to. Comedic actor Mike Myers will make his directorial debut with Supermensch: The Legend of Shep Gordon. Not only is Shep an extremely nice guy, he is also worthy of his own documentary. You may possibly know Shep as a producer and manager and mensch, but I doubt you knew he was the inventor of the celebrity chef. The Irish are masters of large-scale comedies and Life's A Breeze promises laughs and many sweet moments. A home makeover has tossed out the mattress that granny has been using as her safe deposit box. The whole country gets involved in the hunt. The cast is top-notch; you know their faces and talent, but ne'er a name. The Sun Valley Film Festival will screen over forty short films. The festival offers a series of panels and discussions. Most interesting is conTent, an exploration into the future of digital entertainment. Making a movie has never been easier or cheaper. Leaders of Wired Magazine, YouTube, Brooklyn Films, Electus and IndieFlix will define the ingredients in our ever-changing soup of synergy. Another program. The early morning Coffee Talks allows informal conversations with filmmakers. You can lip a latte with Mariel Hemingway. To hell with the films, the best part of a festival is the parties. The Sun Valley Film Fest offers quite a few opportunities of fun with bands of all stripes. Every day before the sun sets, Apres Ski Bites will lay out a spread of snacks from the valleys best restaurants. Schedule a snooze late on Sunday morning; you may need it after Tito's Handmade Vodka Bloody Mary Brunch. If you are afraid that you might be having too much fun, remind yourself that National Geographic will premiere three nature-loving educational films. The august organization will also announce the winner of the international Wild To Inspire short film contest. The Sun Valley Film Festival suggests that you pack your sensibilities and intellect for their aesthetic feast. Don't forget your skis. Gordy Grundy is a Los Angeles based artist and arts writer. His visual and literary work can be found at www.GordyGrundy.com.